I’m not the only one who’s trying to improve his writing craft here in the house. My four year old son is as well. Whenever my daughter is doing her homework, he’s supposed to do worksheets alongside her. Things like math sheets, learning the sounds of the alphabet, practicing his penmanship, and so on. 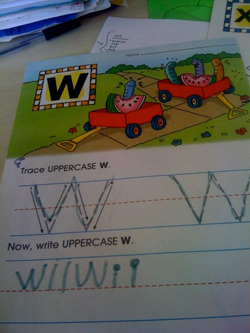 Well, the other day he had to practice writing the letter “W”. So my wife gave him one of those sheets that shows you how to write the letter, with little paths to trace, and then some blank lines. That’s right. For those of you who live on a different planet, that says “Wii.” As in Nintendo Wii. My response? You, my little dude, are awesome.